Fall is one of the best times to start something new. Even though it’s been years since I’ve headed back to school in September, I always see this time of year as a fresh start. The Whole30 diet plan is a proven way to elevate your health, fitness, and energy levels, so if you’ve been feeling like you need a fresh start, it’s time to incorporate Whole30 approved recipes into your life. You may not realize it, but the foods we eat really impact how we feel. Fill yourself with junky, craving-inducing foods, and you’re bound to feel sluggish and low energy. Fill your body with fresh, whole foods and you’ll feel energized, productive and recharged. There are so many foods that cause inflammation and irritation in the body, and you’re probably eating them every single day. The Whole30 plan isn’t just a diet, it was created to help you change your lifestyle and enhance your habits and relationship with food and your body. If you follow the system for 30 days, you’ll change the way you eat for the rest of your life. Focus on making good food choices everyday – the only way it will truly work is if you don’t have any cheat meals. One more rule. No weighing, measuring or counting calories. You can weigh yourself before and after, but analyzing your body too much throughout the process won’t do you any good. If you’re getting started with the Whole30 diet plan, you’ll want to know what you can eat on Whole30 and what you can’t. If you stick to healthy whole foods, you’ll notice a huge difference in how you feel and your eating habits will be impeccable moving forward. Take a look at the foods you can and can’t eat on Whole30. Junk foods like cookies, pizzas, chips, chocolate bars, etc. Now that you know what you can and can’t eat on the Whole30 diet, check out these Whole30 easy recipes so you’re never wondering what to make! We’ve listed over 50 recipes for breakfast, lunch, dinner, snacks and desserts so you can enjoy the meals you’re eating on the Whole30 diet plan! There you have it. Over 50 Whole30 food recipes to help you lose weight and live a healthier lifestyle. Incorporate these recipes into your meal plan for the next 30 days and you’re sure to feel amazing when you’re done! Good luck! 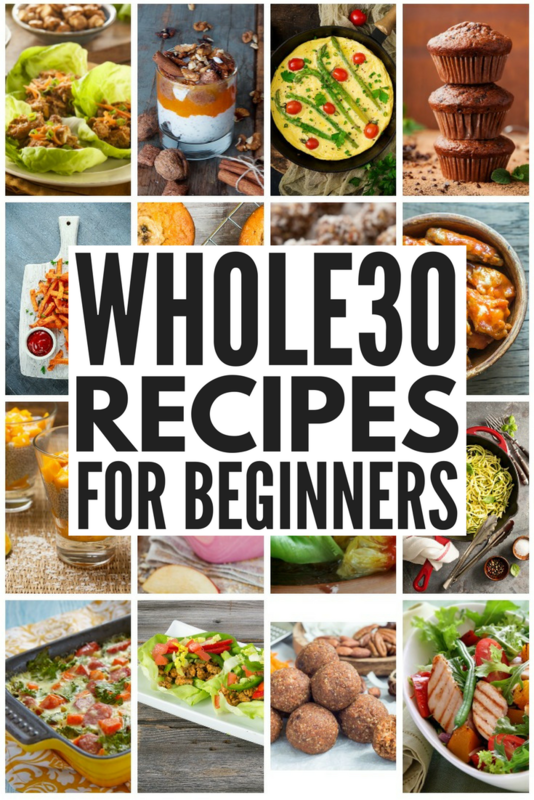 If you liked this list of Whole30 approved recipes, please share it on Pinterest! And if you’re looking for more health and weight loss tips, please follow our Health board on Pinterest!